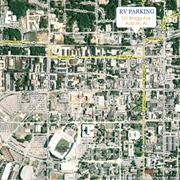 These are some photos of a parking area that we rent out that is adjacent / easy walking distance to downtown Auburn shopping and dining all within a block. We primarily only rent this area and the across the street parking lot out on Football game weekends when our park and other parks are full. We are open to renting the spaces out other times of the year on a limited basis but the restriction would be that it has to be a class A, B or C Motorhome only no travel trailers or 5th wheels in this location. The area is long enough for two 45 ft Motorhomes and is concrete and has a wide wide turn in, both spaces have 50amp service and one has full hookups of Water, Power, Sewer and Cable, Please call 334-821-2267 for details on this service. 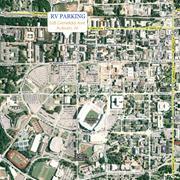 We also have a lot across the street that we can park several large rigs in a paved lot for football gamedays as well. All of these services are subject to the same rules that apply in the park as well as Lee county Alabama 13% lodging tax.